It’s finally summer, and wedding season has begun! Asking a couple hundred people to spend their afternoon & evening outdoors can pose some logistical challenges, but with a little bit of forethought you can make sure the two of you & your guests are well taken care of as you celebrate your new marriage in the epically beautiful out of doors! 1. Provide water & lemonade (or just water!) to guests when they arrive before the ceremony (and have enough water on hand to last all night!). And make sure you have access to enough water. This is not an issue if you’re getting married at a standard venue – but if you’re getting married at your friend’s house out in the county, or some place that doesn’t usually host big parties, and they have a well and it’s been a dry year….you might not have enough water onsite for a couple hundred folks. Bring lots of water in gallon or 5 gallon jugs – your caterer can help you figure out how much water to have on hand if you don’t have reliable access to well water! 2. Make sure guests have access to shade. If possible, allow your guests to wait in a shaded area (either under trees or under a tent) before the ceremony starts. 3. Consider the ceremony location & ceremony timing. What time will your ceremony be, and who will be facing the sun? If you’re still deciding on a ceremony time, consider choosing a late afternoon start time – sitting out under the sun midday can be pretty taxing for the two of you and your guests! If you have already chosen a time for the ceremony to start, if you have any wiggle room with where exactly to hold the ceremony, it can be nice to make sure that all the guests aren’t staring straight into the sun. That said – if the only place to get married at your venue is at a specific spot at an inflexible time and guests are facing the sun… they’ll make do, and be fine. Don’t fret about this detail – it’s just something to consider if you have room to make adjustments! 4. Have sunscreen & bug spray on hand. If your reception is also outdoors, it’s nice to have a little basket of outdoor toiletries available…. You don’t need individual bottles for each person, but just having a small basket with a couple bottles of sunscreen & some bug spray can be a life saver for guests who forgot to bring these items with them. 5. Think about your comfort when choosing your outfits! Imagine the weather on your wedding day when choosing your clothes… the outfit that might be fine in an air-conditioned ballroom might feel stifling & heavy outdoors. An outdoor, summer ceremony might call for outfits that are a little lighter & a little looser! And consider some back up clothing – it can be nice to have some back up clothes/shoes for the two of you, or some extra pieces to let you move comfortably from day to night… if it gets a bit chilly at night, maybe bring a shawl or jacket. If it looks like it’s going to be smokin’ hot all day, maybe toss an extra button down in your car, in case you want a less sweaty shirt to change into later – whatever you need to stay comfortable! 6. Give permission to your guests to wear practical shoes. If your venue has a long gravel driveway for guests to walk down, if your ceremony is in a field… let your guests know this is not the right time to wear stilettos! And if there is a bit of a walk involved between the parking area & the ceremony site, it’s a kindness to give your guests a heads up. 7. Make sure guests have appropriate attire. Let your guests know that it can get a bit chilly at night, even when it’s been hotter than blazes during the day! A note on your website in the section on attire can clue people into the fact that they might want to bring a light sweater, jacket or shawl & stash it in their car for after the sun goes down. 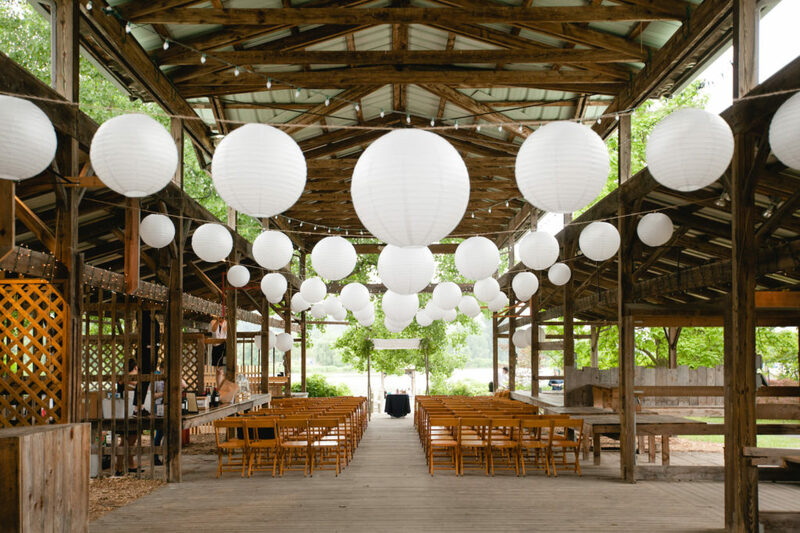 For an outdoor wedding in a field or a backyard, you’re likely going to be bringing in all your own lights. It’s a good idea to make sure you have plenty of light in areas where guests will be traversing uneven ground or walking through unlit areas. Depending on your design vibe & access to electricity, you can choose between strategically placed tiki torches, candles (battery operated candles are best – they’ll last longer & will still be bright even if it’s drizzling! ), lanterns or string lights in and around trees. Battery powered mini-string lights are perfect for providing light inside a portajohn. And during the day, get a sense for where ditches or other possible ankle-turning areas may be, and either block off those areas, or make sure they’re well lit! 9. Gentle reminders to guests about ticks & having a tick remover onsite. And along those lines – it’s a good idea if someone at the wedding has a tick remover. These are inexpensive & sold everywhere – ideally, your coordinator or day-of person will keep one on them, and if a parent sees that their kid has been bitten by a tick, it’s easy to just take care of it right then & there, applaud the kid for their bravery & send them on their way! 10. Have a rain plan! I know, I know. You probably don’t want to think about it raining, after all the hard work you’re putting into your beautiful outdoor wedding! However – there are couple of different tactics to take regarding rain. First – oftentimes, we’re only talking about a passing storm. If you can build in a little flexibility into your schedule, your day-of person or wedding planner can make the call to postpone the ceremony, open up cocktail hour, and see if the rain will pass in 15-20 minutes or so… I’ve done this a couple times, and it works out great! Guests are happy eating & drinking while they wait, and the couple & the wedding party can be tucked away, sipping on champagne & snacking as the storm passes. And as photographers will tell you – post-rain lighting is absolutely beautiful! If you go this route, make sure there are some towels on hand, in case the chairs need to be quickly wiped down after the cloudburst. However – if it starts raining & it’s not going to stop – don’t lose heart! Some of the most amazing weddings I’ve worked have been on rainy days. The event becomes so much more intimate as guests are all under the tent together, staying warm & dry and celebrating the couple! Plus, rain on your wedding day is good luck. So no matter the weather, you can’t go wrong! And lastly… cultivate an expansive & accepting attitude towards whatever the weather may be. Whether it’s rain or shine, know that you’re there to marry your beloved (which you’ll do no matter the weather! ), and that the rest is just details. Accepting & embracing whatever nature happens to throw at you that day can be a lovely exercise in acceptance – and you can put a positive spin on any situation. If it’s raining all day and night during your wedding? You can always just get out there and dance in it! Let’s plan for the marriage AND the wedding!